Let’s face it, sport and intelligence don’t always mix. Just look at the Sunwolves playing half of their games in Singapore. Or the Australian Cricket team selectors’ inability to pick appropriate sides for the subcontinent. Or Nick Kyrgios. This is the first of several articles (assuming I don’t get too lazy) picking out some of the comments and actions made by fans, players, coaches, officials, and journalists that normally draw an embarrassed silence. Referees don’t cheat because they don’t actually compete. They can’t win anything. If they did, there’d be an ad on the top of this article offering the kinds of generous odds on the referees that couldn’t possibly make people have to do their grocery shopping at the Reject Shop. Put the refs in a multi and get your cash back if everyone actually realises that they’re independent arbiters who gain no benefit from making mistakes. Double your money if it’s a 15-year-old officiating an under 10s game and no adults threaten to bash him. But please, gamble responsibly. I’d be really worried if I was the coach of a basketball team that needs such a constant reminder. The main question is why fans participate in this pseudo-brainwashing chant. Really? I thought those players who didn’t have pie stains on their uniforms achieved the victory without your assistance. 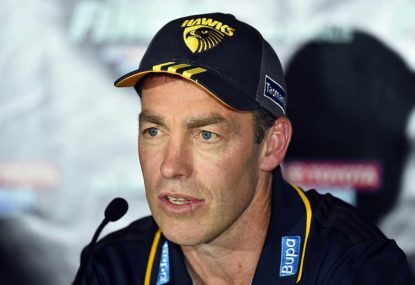 When Hawthorn failed to get the chocolates on Easter Monday (lack of originality is somehow OK when written with irony), Alastair Clarkson did not blame the work-enforced absence of the guy that usually sits in the third row of bay 14 who waves a scarf that has never been washed because it’s ‘lucky’. Mind you, that’d make for an interesting press conference, especially if Clarkson threatened to punch the supporter next time he saw him. If supporters really matter so much, Manly would never win an away game. And Central Coast Mariners wouldn’t even win at home (perhaps I should’ve found a better example). Completely aside from the fact that AFL trend is more towards running and handpassing than ever, this one is baffling. Aerial ping pong? What other kind of ping pong is there? You can’t drive the ball through the net like an ice hockey puck. Or maybe they feel the need to differentiate the game from beer pong, which seems unnecessary since beer pong requires greater coordination and is cared about outside of certain areas of Australia. Those who didn’t get enough from the Adam Goodes reference may now do their magic.